Fred was born in 1894 the son of Thomas Curtis and his wife Sarah Ann née Samuels. He was the youngest of their nine children, his siblings being: Sarah Ann (born 1870), Louisa (1872), Thomas William (1874), Emily (1877), Henry (1879), Charles (1882), Albert (1885), Arthur (1887) and Kate (1891). The family lived for a period at 4 Prince’s Place, an alley off the east side of Cheap Street, before moving to 12 Smith’s Buildings, Stroud Green (now 71 Greenham Road). Not long after the move, when Fred was three years old, Thomas died leaving his widow to raise the younger children with the help and support of the elder adult children. Sarah Ann worked as a charwoman to bring in some income while the children went out to work when they finished their schooling aged 14. Fred found employment for a while as a house painter before he was taken on by Lloyd Baxendale, owner of Greenham Lodge and its estate, which comprised of Crookham and Greenham Commons as well as land stretching north from these commons to the River Kennet. Baxendale built Greenham Lodge on this estate on the edge of Newbury that he purchased from the profits of Pickfords, the transport company his father, Joseph, had transformed from a regional carrier into the country’s most notable removal firm. Given Fred’s earlier employment he may well have worked as a handyman/decorator for Baxendale. 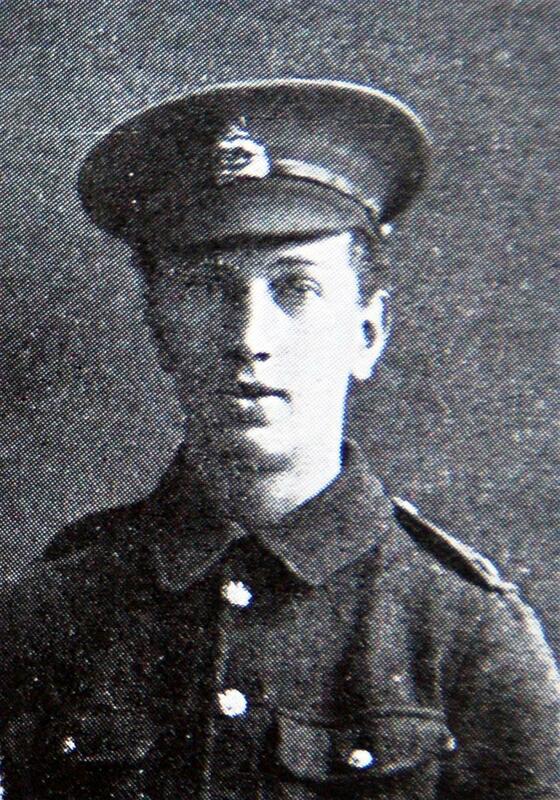 A month after Britain entered the war with Germany, on 7 September 1914, Fred enlisted into the Royal Berkshire Regiment and was posted to the newly formed 8th Battalion, one of the Kitchener or Service battalions raised from the hundreds of thousands of men who came forward in 1914 in response to Lord Kitchener’s appeal for volunteers. Army records have his name as Frederick whereas his real given name was clearly Fred; this may have been a natural mistake by an army clerk, or it may indicate that Fred thought he should be a Frederick. Fred and the rest of the 8th Battalion crossed to France on 7 August 1915 where it was attached to the seasoned 2nd Brigade, 1st Division as a replacement for a Guards battalion that had been moved to the newly formed Guards Division. Ten days later they had their first experience of the trenches when they marched to Noyelles les Vermelles and went into the line, each Company being attached to an experienced battalion who would show them the ropes. Five days later, on 22 August, the battalion took over a section of trench on its own account. A month later they were once again going up the line after a period of rest and training, this time, however, their task was not simply to hold the line - they were to take part in the largest British offensive of the war to date. On 25 September they went ‘over the top’ in the first wave of assaulting troops in what became known as the Battle of Loos. 5:50AM. The intensive Bombardment, preparatory to the attack on the German position SOUTH of the HULLOCH ROAD, began, the enemy's artillery at once replying, though they inflicted little damage and caused few casualties in our front-line trenches. Simultaneously with the bombardment, the gas company began to operate the gas cylinders which were in the front-line trench, and there then occurred several casualties from poisoning, caused it supposed, by leakages in the cylinders. 6:28AM. The gas now ceased, and smoke bombs were thrown from the front-line trenches, proving entirely successful in screening our Advance. 6:30AM. The fire of our artillery lifted, and Battalion advanced in quick time, to assault the first line Enemy Trenches, the 10th Gloucester Regt being on the right, the 2nd Gordons on the left. The advance was opposed by heavy artillery and machine-gun fire, while the wire in front of the German trenches was found to be scarcely damaged, and it was in cutting a way through this obstacle that most of the regiment's heavy casualties occurred. Shrapnel and machine-gun combined to play havoc in our ranks, and an additional disaster was the blowing back of our gas, by the wind, into our own ranks. However, after a struggle, the German first line was penetrated, and the trench found to be practically deserted, the enemy apparently, having deserted it earlier in the day, merely leaving behind sufficient men to work the machine-guns. Mainly overland, but with some men working up the communication trench, our line advanced successively to the 2nd and 3rd German lines, and met with but slight opposition. From the 3rd line a further advance was made, and an Enemy Field Gun captured. A 4th line German trench was also seized, but being in so incomplete a state that it afforded little cover from rifle fire and none whatever from shrapnel. COLONEL WALTON ordered the line to be withdrawn to the 3rd German line trench, and this position was occupied until the Battalion was relieved. 10:0PM. COLONEL WALTON was ordered by the Regimental Medical Officer to leave the trenches for medical attention, as he was suffering from the effects of gas-poisoning, and the command of the Battalion passed, for the night, into the hand of 2nd Lieut T.B. LAWRENCE. 6:30PM circa. The following is a report by Lieut C. GENTRY-BIRCH:- "At this point (i.e. when the Battalion was negotiating in German wire) about 50 of the 8th R. Berks R became separated from the remainder of the Battalion and attached themselves to the Gordons advancing and taking the German guns in the 4th line German trench. They then advanced and occupied the road WEST of HULLUCH. We were unable to advance further owing to our artillery fire, which was falling short. We then waited for support to come up, in the meantime starting to dig ourselves in. 3:30PM “At 3.30PM the Germans counter-attacked, driving in our flanks and as the support had not yet arrived we were compelled to retire, holding a position about 100 yds WEST of the road. The Berks numbers were reduced to about half. On receiving news that the supports were coming up we again advanced to the road which we proceeded to place in a state of defence. 11:30PM. "At 11.30PM the Germans again counter-attacked in large numbers driving in our right flank. We retired to the position we had before held in the afternoon. The Germans continued to push the counter-attack. Our support line then opened fire and we were caught between the two fires. We then made our way as well as possible to our supporting line (the German 4th line). Only 6 of the Berkshires returned safely. The Germans continued to push the counter-attack, but suffered heavily and were driven back. - C. GENTRY-BIRCH LT."
It is impossible to tell where or when Fred was killed, he may have been an early victim as the German counter barrage attempted to break up the British advance, or he may have fallen in the outskirts of Hulloch, the furthest extent of the battalion’s advance that day. The fact that his body was not recovered suggests that he was either a victim of shellfire or died in the area between Hulloch and the line the battalion was forced to fall back to by the German counter-attacks. What is clear is that his death went unobserved by any of the survivors, for he was reported ‘missing’ when the day’s casualty return was compiled. On 4 October the war diary records the battalion’s casualties: 68 killed, 181 wounded and 268 missing. Pte F E Curtis, of the 8th Royal Berks, reported missing since September 25th, is the youngest son of Mrs Curtis, Smith’s Buildings, Stroud Green, who has also another son of the 5th Royal Berks still in hospital at Leicester, with shrapnel wounds in the right shoulder. Pte F E Curtis was one of ten in the employ of Mr Lloyd Baxendale, Greenham Lodge, previous to the outbreak of the war, who have since joined the colours. One of these has been killed and two wounded. CURTIS. 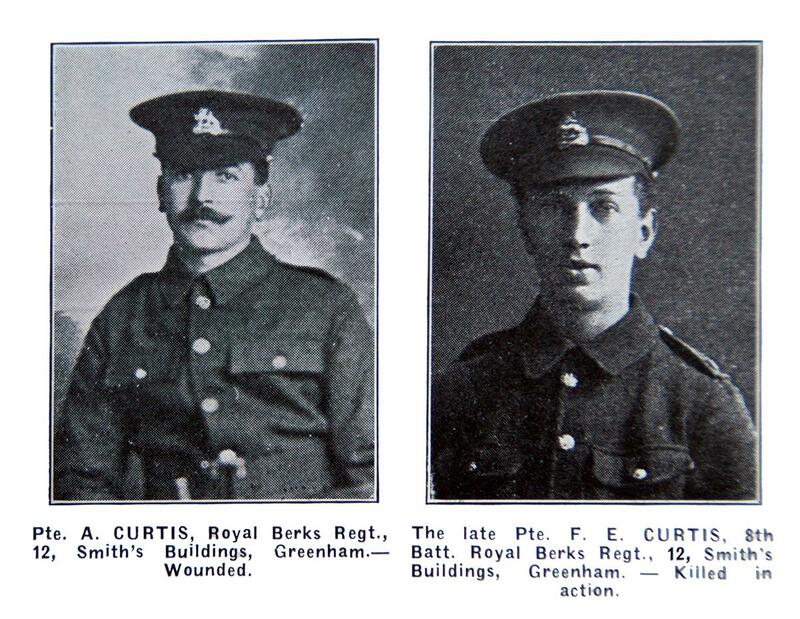 – Pte Fred Ernest Curtis, reported missing since September 25, 1915, now reported killed in action September 25th, youngest son (aged 21 years) of Mrs Curtis, 12, Smith’s-buildings, Greenham. Fred’s body was never identified, perhaps he lies in one of the thousands of graves marked A Soldier of the Great War and bearing the epitaph Known unto God. His name is remembered on the Loos Memorial at the Dud Corner Cemetery near Loos-en-Gohelle, which stands on the site of the Lens Road Redoubt, captured by the 15th (Scottish) Division on the day Fred died. In loving memory of my dear son, Fred Ernest Curtis, who was killed in action, September 25th, 1915, at the Battle of Loos, aged 21, of Smith’s Buildings, Greenham. To take him to His home of rest. From his Mother, Brothers and Sisters. In loving memory of my dear son, Pte F E Curtis of 12, Smith’s Buildings, Greenham, youngest son of Sarah Curtis and the late T Curtis, who was killed at the Battle of Loos, aged 21. And dwell on your memory of days that have been. From his Mother, Brother and Sister. 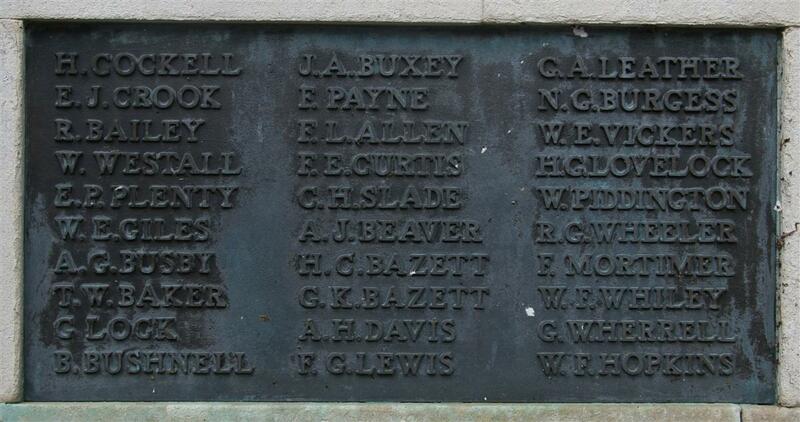 Locally Frederick is remembered on tablet 9 of the Newbury Town War Memorial and on the Greenham War Memorial in St Mary’s, Greenham. wounded by Shrapnel while in working party. Albert’s wound proved serious enough to end his war service, he was discharged, unfit for further service, on 1 August 1916. Another brother, Arthur, also served. 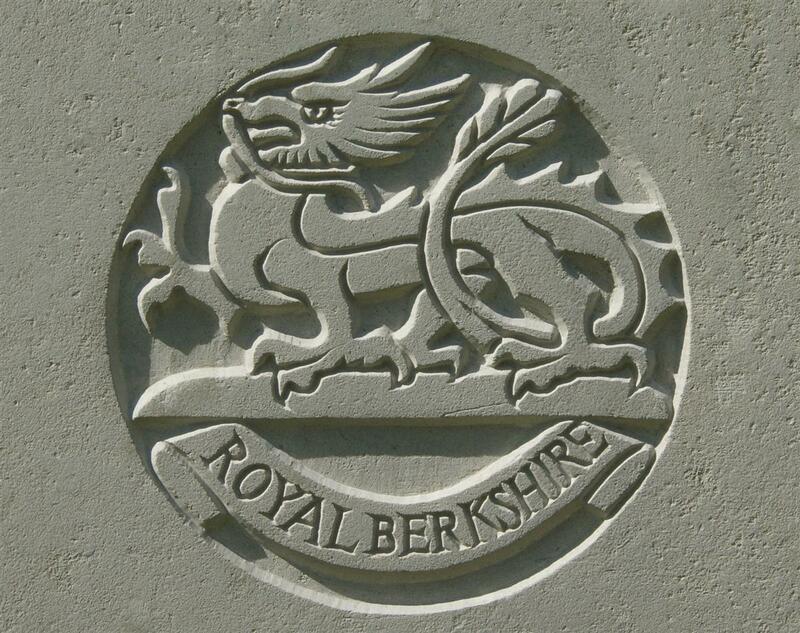 In his case he was conscripted on 26 June 1916 into the 4th (Territorial) Battalion of the Royal Berkshire Regiment and was given the regimental number 20432. In 1917 the Territorials were renumbered in order to remove the confusion often encountered where two men in the same regiment (Territorial and Regular/Service) had the same number. Arthur’s new number was 203126. A few months later he too was discharged as unfit; in his case the cause was sickness rather than wounds. Albert and Arthur were both issued was the Silver War Badge, which was issued to men who applied for the badge after being discharged through sickness or wounds. The badge could be worn on their civilian clothing and indicated that they had ‘done their bit’ and should not be viewed as ‘shirkers’. Two more brothers (Henry and Charles) were within the age covered by conscription and may well have served, but it has not been possible to identify them as any of the many servicemen named Henry or Charles Curtis.